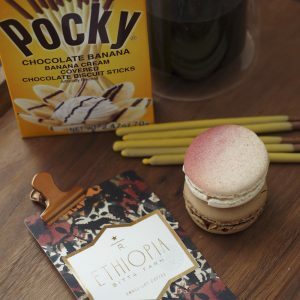 Ethiopia Bitta Farm paired with banana pocky and dark chocolate and raspberry macarons…. 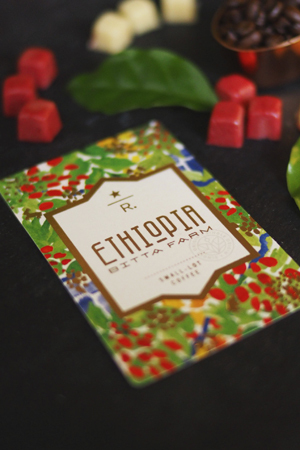 I have been tracking Ethiopia Bitta Farm at the roastery. To see it unloaded, destoned, roasted and bagged for reserve stores is incredible. To see how many different hands touch the coffee in this final stage, before it reaches us at the store. These are my favorite kinds of tastings, to piece together a story, as I am watching the coffee unfold in front of me. This coffee comes from the Kaffa region, where legend has it this is where curious goats gnawed berries from shrubs and experienced a surge of energy. 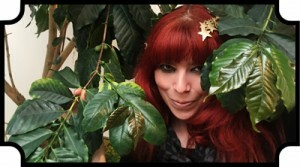 When the goatherd tried the berries himself, coffee was discovered. Each bean is a direct descendant of legend.